A bustling nebula full of bright young stars is dominated by a cosmic superbubble in a remarkable new image of a star cluster in a neighboring galaxy. The superbubble is carved by the winds of newborn stars and the shockwaves from violent stellar explosions, according to astronomers. One such region, which surrounds the star cluster NGC 1929, is featured in this close-up image from the European Southern Observatory's Very Large Telescope, located at the Paranal Observatory in Chile's Atacama Desert. The NGC 1929 star cluster contains hot young stars that are emitting intense ultraviolet light and causing the gas to glow. The nebula around this cluster, officially called LHA 120-N 44 (or N 44 for short), contains what astronomers call a superbubble. The massive shell of material that makes up the superbubble extends roughly 325 by 250 light-years across. In comparison, the nearest star to our sun is located just over four light-years away. 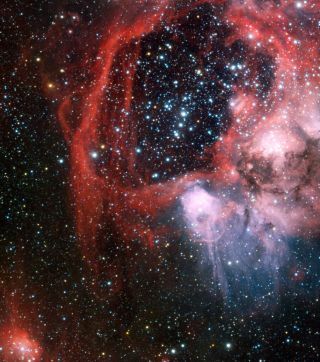 The N 44 superbubble is primarily shaped by two stellar processes. First, streams of charged particles in the form of stellar winds released from the very hot and massive stars in the central cluster clear out the nebula's central region. Massive cluster stars then end their lives in supernova explosions, creating violent shockwaves that push the gas out further to form the glowing bubble. But, even though the superbubble is shaped by destructive cosmic forces, new baby stars are forming around the edges where the gas is being compressed. This dynamic life cycle process means that NGC 1929 will also be home to the next generation of stars, astronomers said. The observations used for this image were selected by Manu Mejias from Argentina, who participated in ESO's Hidden Treasures 2010 astrophotography competition, which ran from October to November 2010. The contest gave amateur astronomers the opportunity to search through ESO's vast archives of astronomical data to identify hidden gems amongst the extensive records for beautiful images of the night sky using real astronomical data.